Cushioned in the splendid mountain range with the excellent surprises of nature is the Tungnath Temple, among the highest erected shrines of Lord Shiva, nestled at an altitude of 3,680 m. It has been magnetizing millions of Hindu pilgrims from the last five years because of its majestic setting and religious significance. 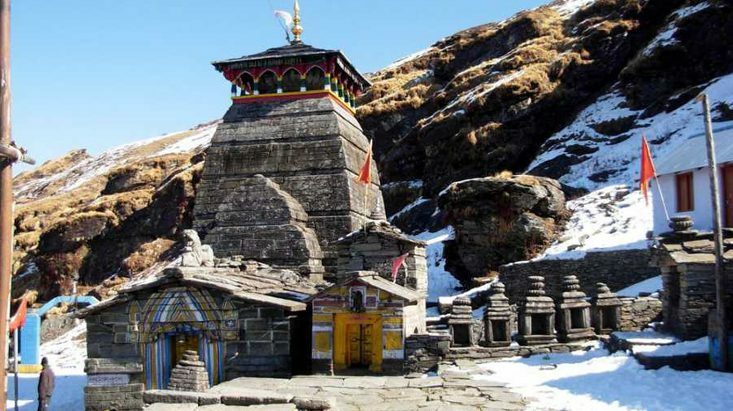 Tungnath Temple, attained a second position in pact of Pench Kedar, the others are Madhyamaheshwar, Kedarnath, Rudranath and Kalpeshwar. A mild aroma of marigold and sandalwood, a gentle puff of air, vistas of snow clad mountains and scenic exquisiteness bestow one an exceptional sort of feeling and never let him/her have a sense of fatigue or exhaustion. The temple is connected with lots of stories of ancient time. One of which is Lord Ram carrying out meditation to get released off the curse of Brahmahatya for having slaughtered Ravana. Thus, it started hailing by the name of Chandrashila since then. Constructed in north Indian style as other temples, the interiors of the temple are made of marble with ornamented walls. At a time only 10 people can be accommodated inside the temple. A stone picture of Nandi has been placed in front of lord Shiva idol, which is at the entrance, while on the right; a picture of Lord Ganesha has been installed, which is worshipped with flowers by devotees. Morever, there are numerous smaller temples situated around this shrine having housed images of some gods. It was built more than 1000 years back and is allied with Pandavas, who attained victory during the Kurukshetra war by killing their brothers. But after the war, Pandavas were guilty of the killings and went out in search of Lord Shiva to take blessings for their liberation. Since Lord Shiva was so much infuriated by the loss of Kaurvas, he avoided meeting with them completely. When Pandavas didn’t have a glimpse of Lord Shiva in Kashi, they headed towards Himalaya then followed him till Kedar where Lord Shiva changed himself into a bull having seen them coming closer. Pandavas had the sign and found him in the appearance of bull and when Bhim moved towards him to stop Lord Shiva from evaporating; he went underground leaving his hump behind. Seeing the dedication of the Pandavas, Lord Shiva released them from their sins. Since then, Lord Shiva is adored in the form of arms at Tungnath Temple, erected by Yudishter, the eldest among the brothers of Pandavas. One of the most popular treks that draw folks from wide and far to undertake the hike at any time of the year is Chandrashila Peak. While hiking, people get an opportunity of catching glimpses of splendid Chaukkhamba peaks, Trishul peak, Bandarpunch and Nandadevi peak. Positioned at an elevation of 13,000 ft above sea level, it factually signifies “moon rock” and according to the legend Chandra, the moon god had done penance here. Travelers can get on the train from the suitable destination till Rishikesh, From there they will be about 10 hours away. After reaching Chopta one has to begin a trek of about 5 km that goes through the Tungnath Temple. Though it is a sacred destination, thousands of drifters throng to this place in the months of summer to carry out one of the magnificent trails of the globe. The trek begins from Chopta, nestled at a distance of 37 km from Okhimath. One would indisputably be amazed by the superb views of Himalayas and vista of gushing flow, which create a heavenly ambience.